With 3D Accuscan®, you now have the ability to quickly and easily reconstruct most bony defects and soft tissue deﬁciencies. Simply supply us with the appropriate CT scan, and we will schedule a virtual planning session during which we will assist you in designing an implant specifically for your patient. Additionally, we can produce a 3D model of your patient’s anatomy as a consultation or surgical aid. 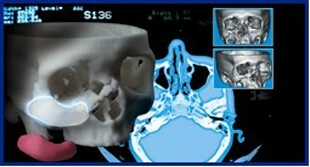 Please contact us today at 1-800-733-0833 for more information about 3D Accuscan from Implantech!